Offers products for sale from a range of products carried by the company he or she represents and the suitability guidelines set by said company and FINRA. The fiduciary standard requires advice to be provided in the best interests of the client including the disclosure of possible conflicts of interest. 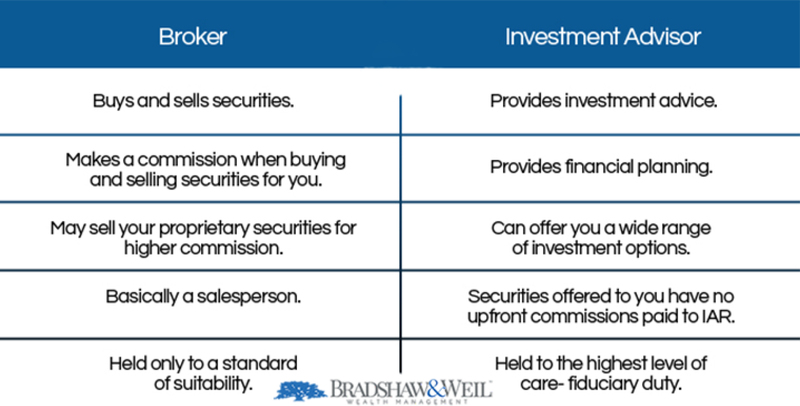 The suitability standard states that a broker only needs to check the suitability of a prospective buyer, based primarily upon financial objectives, current income level and age, in order to complete a commissionable sale of a financial product. In a way, when a broker checks the suitability of a potential buyer, they are measuring how much financial product can be sold, not the needs of the investor in Paducah. relied upon to be fair for the advantage of the client? These are only a few things to consider when choosing a financial planner in Paducah for you and your family. If you would like to schedule time to learn more about Bradshaw & Weil Wealth Management and how they could assist you and your family’s future, please call 270-444-7291 or visit their website http://www.bradshawweilgroup.com/wealth.html to learn more. Investment advisory services offered through Virtue Capital Management, LLC (VCM), a registered investment advisor. VCM and Bradshaw & Weil Wealth Management are independent of each other. The content of this website is provided for informational purposes only and is not a solicitation or recommendation of any investment strategy. Investments and/or investment strategies involve risk including the possible loss of principal. There is no assurance that any investment strategy will achieve its objectives. Fiduciary duty extends solely to investment advisory advice and does not extend to other activities such as insurance product sales, including annuities, life insurance, and long term care insurance or broker dealer services. Advisory clients are charged a monthly fee for assets under management while insurance products pay a commission, which may result in a conflict of interest regarding compensation. Brandon Morgan is also a licensed insurance agent. In this capacity, Brandon Morgan may offer fixed life insurance products and receive normal and customary commissions. The client is under no obligation to purchase products through Brandon Morgan on a commissionable basis. In addition, Brandon Morgan may receive other compensation such as fixed or variable life trails. The potential for receipt of commissions and other compensation when Brandon Morgan acts as an insurance agent may give Brandon Morgan an incentive to recommend insurance products based on the compensation received.